While startups are often housed in dorm rooms, basements, and garages, eventually they will probably need office space when they grow into full-fledged companies. But finding office space is tough for two reasons: First, you’ve got to keep in mind that you must minimize expenses while also chasing your aggressive growth goals – and, at least for the ideation and startup phases, rent is a major expense. Second, a founder has to create an exciting office environment in order to attract and retain the level of talent needed to bring a company into a growth phase. For a startup, there are a few good paths to travel when looking for office space, depending primarily on your current size and growth goals: co-working spaces, co-officing/subleasing, and leasing your own office. A trend in officing that has exploded in popularity since 2005, co-working spaces allow individuals and small groups to have an area dedicated to work. For a startup, it allows for an expansion past the home office. Co-working makes the most sense for startups with less than a dozen employees. Past that point, though, there is a diminishing return on value, as co-working spaces tend to be more expensive per square foot than leasing your own office. During SpareFoot’s first several years, we were lucky to have the opportunity to co-office with a few other startups by subleasing from a larger company. 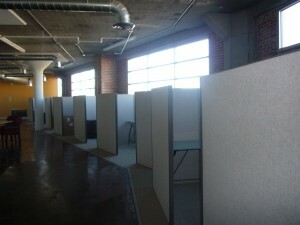 This allowed us to rent office space on a per room basis, making expansion relatively painless. We’ve since grown past the capacity of our original office and found a space of our own, but we will greatly miss the benefits of co-officing. Initial headaches aside, though, the liberty to grow at a rapid pace and customize your space is worth it. A less obvious barrier is the cost of tech infrastructure and furnishings. The price of computers, monitors, Ethernet cords, desks, chairs, cubicles, conference tables – it starts to add up. Also, plan for the unexpected. Take 18” off of the measurement of every room. Schedule an extra week for delays if you’re doing construction. And start your search as soon as possible – you don’t want to be kicked out of an office because your first lease is up before your new space is ready. Your ultimate decision on office space, like many, will be primarily cost-driven. But some startups are on the line between one option and another. For us, co-officing gave us the best of both worlds until we began expanding as rapidly as we are today. Don’t try to make the upgrade from home office to co-working (or from co-working to leasing) too quickly – you don’t want to bite off more rent expense than you can chew – but try to avoid moving more often than you have to. There are substantial monetary and resource costs involved in any move, and these costs grow with the size of your startup. Chuck Gordon is the founder and CEO of SpareFoot.com, the world’s largest marketplace for self-storage. Chuck and co-founder Mario Feghali started marketing for Austin storage facilities in 2009 and have since grown SpareFoot into a 30-employee organization, with dozens of partners including SelfStorage.com and Apartments.com.